The large majority of basic table wines that are produced around the world and that we enjoy with food are dry, including dry white, rosé and red wines. While some may have very small amounts of residual sugar in them, for all intents and purposes they are dry. How do you know if a wine has residual sugar or is dry? There is generally no indication on the label. However, most basic wine styles are dry. For example, pretty much all basic Chardonnays, Sauvignon Blancs, Cabernet Sauvignons, Merlots, Pinot Noirs, Burgundies, Bordeaux, and the like are dry without appreciable sugar in the bottled wine. Only certain specific grapes and styles of wine, particularly dessert wines, consistently have considerable amounts of sugar and can be considered sweet. These include some fortified wines like Port and Madeira as well as some styles which are typically produced sweet such as Sauternes, Vouvray Moelleux, Alsatian Vendange Tardives, many German wines, etc. One important note: This terminology is sometimes confusing to beginners for a very good reason. Many full-bodied red wines are high in tannins, naturally occurring compounds in grapes which contribute to the structure and texture of the wine. Tannins are generally described as having a drying, almost gritty or sandy texture in the mouth. People who are new to wine often describe these wines as very dry because the coarse tannins feel dry and astringent in their mouth. While this is a perfectly acceptable way to describe the sensation of tasting these wines, it can get confusing. In fact, even some sweet red wines like Port can have tannins, despite the sweetness of the wine. So it is best to describe these wines as tannic or to have drying tannins, not as a dry wine necessarily. Also learn about Dry Red Wines, Rosé Wines and Dry White Wines. In wine production, yeast convert the sugars in the wine grapes into alcohol through the process known as fermentation. If the fermentation is allowed to proceed unhindered and the yeast is hearty enough, all the sugar that was present in the initial grapes is completely converted to alcohol. This means that in the finished wine there is no residual sugar. Residual sugar is the term used for grape sugar which is left over in a finished wine after fermentation is over. While some table wines may have small amounts of residual sugar, it is very close to zero and the wine can still be considered dry for all intents and purposes. What Do They Taste Like and What Foods Do You Eat with Them? There is a huge range of styles of dry wines produced in the world. The specific characteristics of each depends on the region they came from, the grape varieties used to make the wine, the winemaking technique and many other factors. Dry, table wines can range from light and fruity to dense, full-bodied and powerful. Just because the wine is "dry" and does not have much or any sugar in it, this does not necessarily mean that the wine cannot have sweet, fruit aromas and flavors. The ripeness of the grapes often impart the sense of ripe, sweet fruit to wines even if there is no actual sugar present in the wine. Typically wines that come from very hot growing regions, such as Australia and California, come from riper grapes which often smell and taste riper and sweeter, even if they are technically dry. This is of course a generalization, but as you taste through wines from different regions you will begin to see the range of flavors that can occur even in dry wines. While pairing each wine with food is different, generally dry wines are good at table, hence the term "table wine". 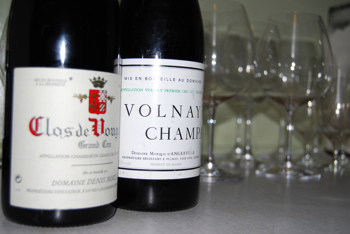 Very sweet wines often clash or feel too ponderous with food. However, dry wines pair nicely with many foods, lighter wines fitting nicely with lighter fare and heavier wines standing up nicely to rich dishes. For more information and tips about pairing specific dry wines with food, be sure to check out our Food and Wine Pairing section! Done with the Dry Wines page?